The Royals offense started early and it overwhelmed Jeremy Bonderman and the Tigers, 7-2, on Faith and Family Sunday at the K.
This is what we want to see more of. Quality Starting Pitching: Brian Bannister went 7 1/3 innings, striking out five and walking only one. Sure, Banny was helped by the early cushion but giving two runs on five hits is solid. Quality Offensive Attack: We had some power (Jose Guillen’s 3-run homer), good hitting and good baserunning (Mitch Maier scoring from third on a ball that didn’t get out to the warning track) in a 15-hit attack where every Royals player collected a hit (even replacement DH Wilson Betemit). Seriously. 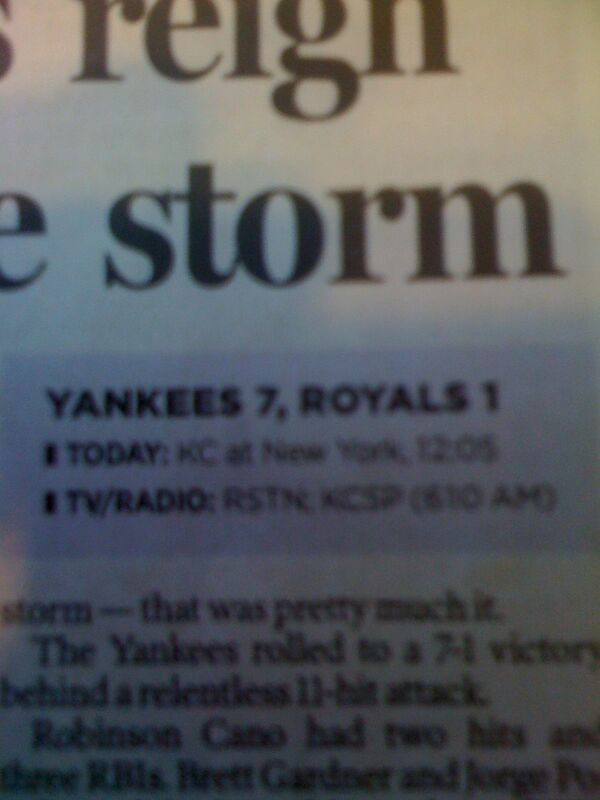 That’s last decade Royals stuff. Soria caught the ball and the game was over, but I can see injuries to our best All-Star game candidate in Butler and our dominant closer in Soria. Great outing by Brian Bannister and a great talk before the Jeremy Camp concert as well. The Royals have alternatives, however. Is Yasmani Grandal a lock for the first pick?